Greg Sextro did the sound design and audio engineering. He's good. The late Annette Hanshaw was a radio star in the 1920's and 30's. Her old jazz and blues recordings give voice to Sita. Singer-composer Todd Michaelsen created the title music, "Agni Pariksha," and most of the score and background music. He is a frequent collaborator of Reena Shah. The talented and versatile Rohan made the music for "Rama's Great," and the soundtrack for the trailer which is called "Burnt Sugar." Rudresh Mahanthappa lent his unique jazz to the scenes in American cities. By some miracle the French band Masala Dosa found me online, and now their music graces the scenes in Trivandrum, as well as various other points in the film. Hooray for the internets! Nik Phelps composed many scores for my short films when we both lived in San Francisco. Now he lives in Belgium, but he still found time to create "Intermission" for this feature. In March of 2007 I asked 3 friends, all natives of India, to discuss the Ramayana in a New York audio studio. Nothing they said was scripted. 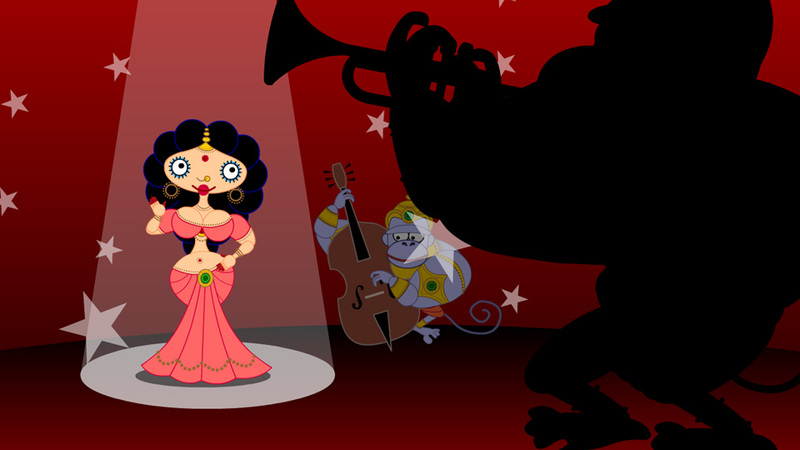 That hour-long session became the narration for Sita Sings the Blues. It must be heard to be believed. Aseem Chhabra became shadow puppet #1. Bhavana Nagulapally became Shadow Puppet #2. Manish Acharya became shadow puppet #3. If Annette Hanshaw affected an Indian accent, she'd sound like talented actress Reena Shah, who played Sita's speaking voice. Reena also danced for the rotoscoped sections of "Agni Pariksha." She is a frequent collaborator of Todd Michaelsen. Debargo Sanyal somehow managed to play Rama straight. Sanjiv Jhaveri played Dasharatha, Ravana, Valmiki, and my ex-husband. Aladdin Ullah played Mareecha and Hanuman. Nitya Vidyasagar played twin boys Luv and Kush, including their singing voices in "Rama's Great." Pooja Kumar gave a spirited performance as Surphanakha. Jake Friedman apprenticed with me the Summer of 2005. He came up with some very creative monkey-on-demon violence for "Battle of Lanka." Ariel Lagares coded my blog page and thankfully shifted the whole thing to wordpress in 2007 so I could ban trolls. Catherine Kirkman and Catalin Cosovanu at Wilson Sonsini Goodrich and Rosati provided pro bono legal services. Permissions beyond the scope of this license may be available at http://www.sitasingstheblues.com/license.html.